APETx2 is a toxin that was originally isolated from Anthopleura elegantissima (Sea anemone). 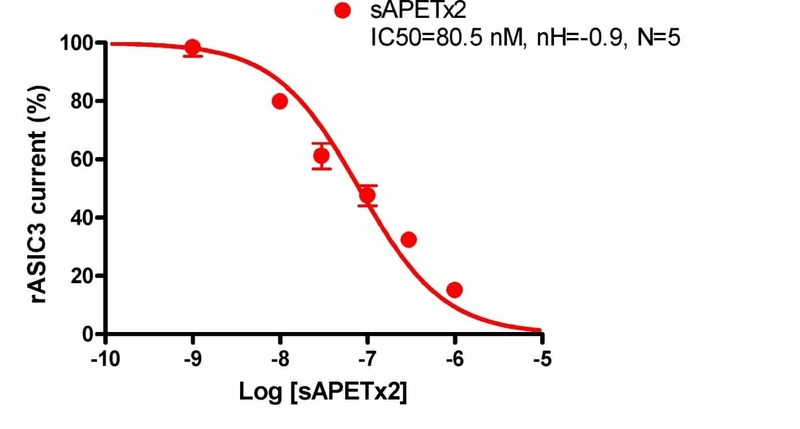 APETx2 selectively blocks the H(+)-gated sodium channel ASIC3 (ACCN3). The blockage is rapid and reversible. This toxin does not block isoform ASIC1a (unlike Psalmotoxin 1) and isoform ASIC1b of ASIC1 (ACCN2), nor ASIC2 (ACCN1). It also inhibits the heteromeric ASIC2b-ASIC3 channel, and has less affinity for ASIC1b-ASIC3, ASIC1a-ASIC3, and no effect on the ASIC2a-ASIC3 channels. IC50 is 63 nM on ASIC3 channel. IC50 is 117 nM on ASIC2b-ASIC3 heteromeric channel. IC50 is 0.9 µM on ASIC1b-ASIC3 heteromeric channel. IC50 is 2 µM on ASIC1a-ASIC3 heteromeric channel. Interestingly, recent studies demonstrated that APETx2 also inhibits Nav1.8 currents with an IC50 of around 2 µM. Fig 1: Dose-response curve of the effect of synthetic APETx2 #07APE002 on rat ASIC3 current recorded in Xenopus oocytes. In this system, an IC50 of 80.5 nM was determined for APETx2 (N=5). Product code: 07APE002. Category: ASIC channels. Tags: ASIC, pain. Human ASIC3 channel dynamically adapts its activity to sense the extracellular pH in both acidic and alkaline directions. In rodent sensory neurons, acid-sensing ion channel 3 (ASIC3) has recently emerged as a particularly important sensor of nonadaptive pain associated with tissue acidosis. However, little is known about the human ASIC3 channel, which includes three splice variants differing in their C-terminal domain (hASIC3a, hASIC3b, and hASIC3c). hASIC3a transcripts represent the main mRNAs expressed in both peripheral and central neuronal tissues (dorsal root ganglia [DRG], spinal cord, and brain), where a small proportion of hASIC3c transcripts is also detected. We show that hASIC3 channels (hASIC3a, hASIC3b, or hASIC3c) are able to directly sense extracellular pH changes not only during acidification (up to pH 5.0), but also during alkalization (up to pH 8.0), an original and inducible property yet unknown. When the external pH decreases, hASIC3 display a transient acid mode with brief activation that is relevant to the classical ASIC currents, as previously described. On the other hand, an external pH increase activates a sustained alkaline mode leading to a constitutive activity at resting pH. Both modes are inhibited by the APETx2 toxin, an ASIC3-type channel inhibitor. The alkaline sensitivity of hASIC3 is an intrinsic property of the channel, which is supported by the extracellular loop and involves two arginines (R68 and R83) only present in the human clone. hASIC3 is thus able to sense the extracellular pH in both directions and therefore to dynamically adapt its activity between pH 5.0 and 8.0, a property likely to participate in the fine tuning of neuronal membrane potential and to neuron sensitization in various pH environments. Solution structure of APETx2, a specific peptide inhibitor of ASIC3 proton-gated channels. Acid-sensing ion channels (ASIC) are proton-gated sodium channels that have been implicated in pain transduction associated with acidosis in inflamed or ischemic tissues. APETx2, a peptide toxin effector of ASIC3, has been purified from an extract of the sea anemone Anthopleura elegantissima. APETx2 is a 42-amino-acid peptide cross-linked by three disulfide bridges. Its three-dimensional structure, as determined by conventional two-dimensional 1H-NMR, consists of a compact disulfide-bonded core composed of a four-stranded beta-sheet. It belongs to the disulfide-rich all-beta structural family encompassing peptide toxins commonly found in animal venoms. The structural characteristics of APETx2 are compared with that of PcTx1, another effector of ASIC channels but specific to the ASIC1a subtype and to APETx1, a toxin structurally related to APETx2, which targets the HERG potassium channel. Structural comparisons, coupled with the analysis of the electrostatic characteristics of these various ion channel effectors, led us to suggest a putative channel interaction surface for APETx2, encompassing its N terminus together with the type I-beta turn connecting beta-strands III and IV. This basic surface (R31 and R17) is also rich in aromatic residues (Y16, F15, Y32, and F33). An additional region made of the type II’-beta turn connecting beta-strands I and II could also play a role in the specificity observed for these different ion effectors. A new sea anemone peptide, APETx2, inhibits ASIC3, a major acid-sensitive channel in sensory neurons. From a systematic screening of animal venoms, we isolated a new toxin (APETx2) from the sea anemone Anthopleura elegantissima, which inhibits ASIC3 homomeric channels and ASIC3-containing heteromeric channels both in heterologous expression systems and in primary cultures of rat sensory neurons. APETx2 is a 42 amino-acid peptide crosslinked by three disulfide bridges, with a structural organization similar to that of other sea anemone toxins that inhibit voltage-sensitive Na+ and K+ channels. APETx2 reversibly inhibits rat ASIC3 (IC50=63 nM), without any effect on ASIC1a, ASIC1b, and ASIC2a. APETx2 directly inhibits the ASIC3 channel by acting at its external side, and it does not modify the channel unitary conductance. APETx2 also inhibits heteromeric ASIC2b+3 current (IC50=117 nM), while it has less affinity for ASIC1b+3 (IC50=0.9 microM), ASIC1a+3 (IC50=2 microM), and no effect on the ASIC2a+3 current. The ASIC3-like current in primary cultured sensory neurons is partly and reversibly inhibited by APETx2 with an IC50 of 216 nM, probably due to the mixed inhibitions of various co-expressed ASIC3-containing channels.